To continue the tradition of making all the folks back home jealous during the winter holidays, this year we spent a week in Puerto Vallarta, Mexico. The weather was perfect pretty much every day. Mornings included runs on the beach followed by afternoons of body surfing, beach volleyball, and soaking in the sun. I could live that way for a long, long time. Anyway, here's the slideshow from that week. I sometimes forget how the rules (or lack of) are a little different down in Mexico, where it's ok for kids to do tequila tasting, it's no problem to ride standing up with a bunch of friends in the back of a pickup on the highway, and local tour companies don't mind letting you hold a live scorpion in your hand while you wait. Living in the States you tend to forget what it's like to live in a place where everyone isn't trigger happy when it comes to suing people. Of course I say this having not gotten scorpion-pronged that week, but it was nice for a change to feel like people can be trusted to make their own decisions and be responsible for the outcomes. Back in December I found out about an artwork exhibition at a local major technology company where they regularly put artwork on display from local artists. After getting in touch with the right people, they decided they liked my stuff and were nice enough to choose a subset of pictures from my Photography Gallery for display. One month and tons of printing and framing later, I am ready for my first major exhibition of 24 pieces. As a result, I decided to create a new section of Greg's Digital, which is the purchase section. Displaying currently framed artwork ranging in sizes from small to extra large, it shows a variety of information about each piece, including pricing for whoever might be interested. I'm really excited to finally see a collection of my photographs in print, nevermind being able to put them on display. Unfortunately the exhibit is open only to employees (even I can't go see it! ), but I'm psyched nonetheless. It's a chilly morning here in Plymouth, and what better way to not go outside than to post up some blog bizness and provide some more links to what I've been working on lately. So, here goes nothing. And by nothing I mean something. This summer was a great one. I was hopping coast to coast every month or so (including plenty of visits to places in between), spent a week on Block Island, a week on Lake Massasecum up in New Hampshire, and a week in London. One of my trips was to Freeport, ME, home of plenty of outlet stores, and more importantly some great nature to take in. One day after work I made a trek through Wolfes Neck Woods State Park, which was a great place to go for a stroll near sunset and take some photos. Since the last post I've finally purchased my own house, which has been an awesome experience. A couple mornings lately we've been visited by a hawk that likes to hang out on the roof here up at the top of the hill. In other news, there's also some movie studios coming to town not far from where I live, so I'm going to do my best to start spreading rumors of sightings of celebrities like Lindsay Lohan (apparently she loves cranberries which Plymouth is full of), Ali G's Bruno character (because P-Town's got a direct ferry here), and David Hasselhoff (the beach is right down the street). Not too long ago, a friend introduced me to a new photo sharing site. I have been a loyal member of Ofoto (which is now Kodak Gallery) since 2001, and have been very satisfied. However, when I saw this new site's full-screen slideshows with photo transitions and music capabilities, it was leaps and bounds better than what I currently had. While it is a pay service, I decided to give it a free trial and see how it goes. Here's my first Greg's Digital album on the new site, with photos from an afternoon run in the fog that I took this past weekend along the shores of Plymouth not far from where I live. Be sure to use the Slideshow, and turn on your speakers. I've been a traveling madman lately. In the past month, I've been to Santa Monica, NYC, Miami, Indianapolis, and a handful of other miscellaneous New England destinations. This week I'm off to LA, San Francisco, and Vegas. The good thing about being on the road is that I can get back to updating the site. Sitting here on my flight from BOS -> LAX, I've finished another round of updates to the Gallery. I've done some organizing, expanded thumbnails, removed pop-ups, and there's a whole lot more content to dig through and (hopefully) enjoy. While I still work on my mirroring and transformations, I feel as if I've been producing a lot more straight-up photographs over the years. I still have a lot more artwork to post, but now I've started adding Photography galleries to the standard Transfromations pages. In particular, the Rhode Island, England, and France. So have yourself a Happy St. Patty's Day, and a Happy Birthday to my buddy Jef whose b-day is always an easy one to remember. Speaking of St. Patty's Day, I will never forget a St. Patty's Day I spent down in Miami back in 2002 with a few friends. Being such a heavy Latin-influenced area, you'd never have a clue it was St. Patty's Day down there. Regardless, having closed down the clubs at 4 am and then grabbed food until 5, we made our way back to the hotel just as it was starting to get light out. Still full of energy for some unknown reason, the four of us scamper up to our room, pack a cooler full of "beverages", and jump into the elevator down to the lobby to make our way towards the beach. Popping the tops of our drinks as we walk through the pool area, we hear a man walking near us say "Hey guys - would you mind taking that down the beach a bit?" Slightly confused but not caring the least in the world, we agree. "Thanks" he replies. "There's an AA meeting going on just up ahead." Sure enough, as we made our way over the small hill between the hotel and the beach we see a group of roughly 30 people gathered in chairs waiting for the sunrise. A sober sunrise that is. We tip-toe by the group with our drinks behind our backs, cooler full of plenty more drinks, and head 50 or 60 yards up the shore away from them, or what we felt was a safe enough distance. Setting our stuff down and being only slightly obnoxious, we try not to be too distracting to the folks down the beach. After a while I grabbed my beverage and set my chair down right where the waves were crashing for a perfect view of the sunrise. Instead of the traditional holiday season in New England this year, I was fortunate enough to be invited on a family trip to Cozumel for a week of snorkeling, windsurfing, lying in the sun, and eating and drinking as much as I could possibly consume. I got a chance to try out my new snorkel set, along with an under water camera case. I wasn't sure how great the photos would come out, but after snapping away on a bunch of snorkeling sessions, I was psyched with the results. All in all, I took probably 5 or 6 hundred photos that week, but narrowed it down to two albums: The short and quick(er) one, and the all-inclusive one (just like the resort we stayed at). I can't wait to go back. This past summer I was lucky enough to be sent to Madrid for a week to perform some training for my job. Arriving a day early to adjust to the time zone and having plenty of sunlight to work with after work, I spent a lot of time walking around the city and soaking in the sights. The weather was perfect, and it was great to get back to a city I'd spent some time in a few years back. My first trip to Madrid back in 2002 was a bit of a horror the first day, realizing that hardly anyone spoke English. I didn't fare well those first few hours trying to find an ATM, food, and a bed for the night with my only Spanish coming from what I'd learned watching Terminator 2 and listening to Sublime's Caress Me Down many years back. This time I came slightly more prepared, and was able to handle my own at places like Museo del Jamon, one of my favorite restaurants in Madrid. Jamon! I rarely get around to updating anything web related in the summer time, and this summer was no exception. Summer is far too precious in New England to be spending time inside pecking away at a keyboard when you can be doing things like paddling around on a kayak off the shores of Plymouth, MA. Since moving down to Plymouth this past May, I've been able to do two things I've missed more than ever since moving to Boston in 2000: kayaking and going to the beach. It's not that I never did these things since moving to Boston, but they were few and far between for the seven years I lived there. Getting out on the water is great, and I try to do it as much as I can before the days become too dark and cold to enjoy it. A couple times this past summer I took along the camera, and on one occassion Bessy, who took a nice dip off the kayak a few seconds after starting to paddle out. Another nice thing about having a kayak is how easy it is to get quahogs. Just off the coast I managed to find a goldmine of them, and after ponying up the $10 for my shellfishing license, I started hitting the water with my bucket. All it took was some walking around in the mud and voila! Quahogs and quahogs everywhere. Most of them are way too big for my tastes and I end up throwing them back, but mmm, are they dee-lish. My buddy Andy is my hero. One of them at least. He's decided to save some money, quit his job, and ride his bike (as in bicycle) from coast to coast, starting in Washington and ending in Maine. Over 3,000 miles of riding. It would have been so great to join him, but who knows how far I would have made it. I get cramps in my legs just riding my bike down the street. He's been updating his own blog along the way, and it's super entertaining to read. Right now he's near Fargo, North Dakota, and it's amazing seeing from satellite the type of ground he's covering. I can't wait to see the photos. Apparently his camera got wet in a big rainstorm and no longer works, so I'm hoping he gets his hands on one soon to keep tracking this insanely awesome trip he's on. Two years ago I was just starting to kick off a summer of work in Paris. The city was in contention for the 2012 Olympics, Paris Plage was in full effect, and occasionally the city ground to a halt due to protests. In a city like Paris, it's tough to take a bad photo. I had my fair share, but it's a lot easier to take quality ones with the amount of amazing architecture and scenery the place has to offer. When I wasn't taking the train out to Saint Germain to work each day, my favorite memories were rooftop breakfasts overlooking the Arc de Triomphe, soaking up the rays afternoons on Paris Plage, chilling atop Notre Dame, afternoons at Musee Dorsay, and evening runs to explore new areas. While my French never improved much beyond what I learned in seventh grade, I still had a blast. Here's an album of color photos from my time in Paris, presented from sunrise to sunset. Tres magnifique! A little over a year ago I spent a weekend in Tahoe snowboarding with some friends. It was my first time to a mountain anywhere other than New England, not counting a failed attempt to snowboard at Glenshee Ski Centre two hours north of Edinburgh, Scotland in the middle of a windy snowstorm where I had successfully rented my board & boots, drove with some friends down one of the most dangerous roads in Scotland, purchased my lift ticket at the base, and then was turned around at the end of the first lift due to strong winds. This time around was a much greater success, minus one small event on one of the last runs of the weekend. Having just paused at the summit with some friends to take some final shots, we headed towards the base cruising our way down for one last run. On the lift ride back, I decided to take a look at some of the photos we'd just taken a few minutes earlier. Looking down at my front jacket pouch where I kept my camera, I froze when I saw the zipper was open. Grasping inside all I felt was cloth - no camera whatsoever. While I was slightly excited about having to purchase a newer, better camera, I was pretty disappointed about some of the photos I'd lost from that weekend - partying with friends and the scenic shots from the summit only minutes prior. As we rode the lift back to the summit we looked down at the trail trying to find glimpses of silver, but all I could imagine at that point was it getting covered by the tiniest bit of snow and some hiker coming across it all rusted out in the spring. Re-tracing our previous path that next run there was nothing to be found, and I figured it was gone for good. Fast forward two days later, when a friend suggested I call the mountain's lost and found department. With nothing to lose, I rang the number and spoke with a woman on the other end. "Hello, I was snowboarding Sunday and lost my digital camera - did anyone happen to turn one in?" "Yeah, I got one right here. What kind of photos did you have on it?" Amazed, I briefly described some of the photos I had from the mountain that weekend, and some older ones from the beach. "And some party/drinkin' photos too?" Slightly embarrassed I replied "Yup." "Oh man, those are great! And there's some guy in a red jacket too?" Having no idea of what she was talking about, I replied "yes". None of my friends that weekend had a red jacket, so an ounce of me thought that it was someone else's camera that had been returned. Odds are pretty good any camera would have some mountain, party, and beach photos on it, right? Three more days later, I get home from work and find a package on my hotel bed. Unraveling the rubber band-wrapped foam hat packaging, I was still convinced it was someone else's camera I had just received. I finally saw that familiar flicker of silver as the packaging came away, and sure enough, there was my camera. Turning it on I saw this photo, the man in the red jacket who the lady had described that was on my camera. This was the man who had found and returned my camera. So, thank you stranger in the red coat for returning my camera. I'm not sure I'll ever get to say thanks to you in person, but at least now it's out there for whoever may see this. And if I ever do get in touch with him, I'll gladly give him a free framed photo of anything on gregsdigital. Last week I framed one of my favorite photos - a shot I took on Block Island one early morning of Labor Day Weekend 2005. Having woken up around sunrise to get some shots around the island, I made my way over to Ballard's and noticed how great the light looked through the waves crashing right onto the shore. Of course, right after I took the shot I had to run so I didn't get soaked by the wave. I love the way it came out, and will gladly print and frame more for anyone who is intersted. Reading The Prophet by Khalil Gibran this evening, it made me think of my photo. Especially this excerpt: "You delight in laying down laws, yet you delight in breaking them. Like children playing by the ocean who build sand towers with constancy and then destroy them with laughter. But while you build your sand-towers the ocean brings more sand to the shore, and when you destroy them the ocean laughs with you. Verily the ocean laughs only with the innocent." I am the best parallel parker I know. It's a pretty bold statement, but I'm going to say it. Especially after the latest challenge I met and conquered this evening. In fact, I'm so confident that I'm going to give $20 to whoever can send me a picture proving me otherwise. Of course, if you're not the one that did the parking, you don't get the 20 bones. It's not something I like to brag about, but since I figure only about 2 people read this thing, I figure what the heck. I park my car in an area roughly a mile from my place, as opposed to paying the $180 a month for a spot next to my building. I save the figuring for how much I'm saving during the below zero cold windy nights when I'm making the ten minute walk back to my place as my face goes numb and my fingers become completely unusable for the next hour while they thaw. For free it's not a bad deal, except during Red Sox games and most nights after 10 during school season. Arriving well after ten on this rainy Sunday night, even the questionable spots were taken (many of which I've gotten tickts for parking in already), except for this one parking spot that was exactly the width of one 1998 VW Jetta + 2 inches. Yes, a total of 175.4 inches according to Wikipedia. Using highly classified, sophisticated, and possibly illegal techniques I will refrain from discussing here, I managed to fit into the spot like a glove. Like an extra small glove shoved onto the hand of Andre the Giant. So yes, please refer to exhibits a, b, and c, and prove I'm not the best parallel parker you know and my original offer will still stand. Happy Parking. Stuck in a major snowstorm in Minneapolis, I've had plenty of time to work on photos and add some new albums. Making the most out of the snow, a coworker and I had some fun with my white 5th-generation Mustang rental yesterday. On another note, I just got back from a fantastic trip to Aruba. Instead of overwhelming everyone with the nearly 600 photos I took that week, I chose my top 50 and put them in a single album. Considering the 81 chapters in this book were originally written over 2,500 years ago, I find it amazing how the lessons it presents are still as true today as they were the day they were written. The best thing I like about this book is how you can pick it up, read a chapter in 30 seconds, and have enough to last you through the entire day. In celebration of the first somewhat noteable snowfall in the Boston area this year (which accumulated to nothing as I woke up in Brookline to bare ground and another dud attempt by Mother Nature), I decided to put up some photos from a trip I took to Mammoth Mountain last Winter. With a fresh snowfall and a 15 foot base, it was the best snowboarding I've ever experienced. I wouldn't think twice about making the five hour drive from LA to do it again. 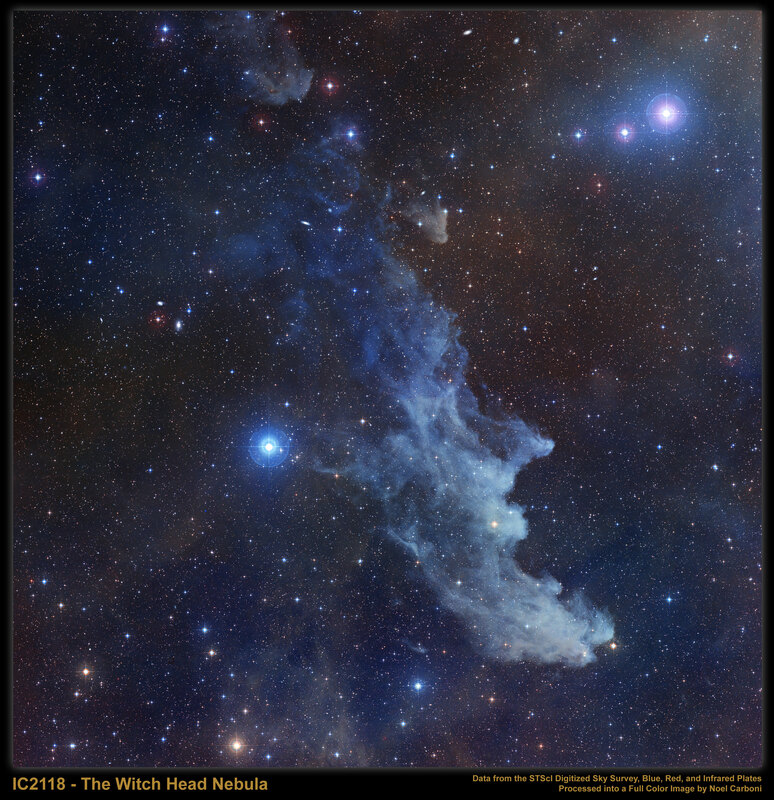 Sitting here in Minneapolis, Minnesota tonight doing my work after a long day of getting up at 4:30 am in Boston, catching a 6:00 flight and working all day, I decided to take a look at today's Astronomy Picture of the Day of the Witch Head Nebula, and what an amazing sight it is. While the photo itself is gorgeous, beyond it shines countless galaxies and stars - about as many as if you took a handful of sand and threw it up into the sky. The sheer volume of it all is amazing. And if you've never seen the Hubble Ultra Deep Field, it's time you took a look. It's a view of our sky as small as looking through an eight foot long soda straw, yet reveals almost 10,000 galaxies. Absolutely incredible. A couple weekends ago we had a gorgeous Saturday in Boston. I decided to finally take my bike out from the basement for the first time this year, put some air in the tires, and go for a spin. After heading down Beacon Street, Commonwealth Ave, and up the Charles River along the Esplanade, I had amassed a significant set of photos from the ride. Here's fifty fresh fall foliage fotos from that day. The past few weeks I've been working in Seattle, and oh has it been raining. Yesterday we received over three inches of rain - the third most rain in a 24 hour period in Seattle history (the record being 5"). When it's not raining I've managed to get a few photos around town and a couple from a night out with some coworkers. Here's the album. In addition, I've added two new artwork and photograph pages to the gallery. It was about a year ago when I started working at a client in Bordeaux, France. On weekends I would fly back to Paris to relax, explore the city, and take more photos. One particular weekend some friends and I took the Metro to a spot north of the city, and slowly made our way back towards Notre Dame. Here's a link to the album from that day. On another note, I have also added many more pieces of artwork to my interactive gallery, including photographs from Malaysia, Thailand, California, and Texas. See if you can find them all! Last March, I went on vacation to Southeast Asia for a couple weeks, and one of my final stops was Kuala Lumpur. Over the course of several days I went on a few walks around the city, took plenty of photos of the Petronas Towers, and experienced first hand several locals' unsuccessful attempt at trying to scam me out of money. It was a great trip indeed, and here are two long-awaited albums containing photos from the trip. And if you didn't catch that link about the scam from a couple sentences back, you can read the long winded aftermath summary here. Otherwise just click on the thumbnails to view albums from the trip. I'm proud to announce a new feature of gregsdigital.com, and it's a Google Maps powered interactive artwork and photo gallery. I've added a ton of new pieces, especially a lot from Paris and London, so use the navigation links on the side to jump between each city. This week I'm back in Pittsburgh, but have been spending most of my summer in Agoura Hills, just north of LA. Every Tuesday night they bring in a chef to cook up pasta on the patio overlooking the valley, so here's a few photos from last week's pasta party. How y'all doin'? I'm in Austin, Texas again this week and have some more albums that need to be posted. Yee-haw! Actually for Texas standards (from what I've seen so far), Austin is a bit of an East Coast style oasis, in that there aren't many cowboy hats, strip malls, Bush fans, or hard-core Texas accents. In fact, there's a whole initiative towards keeping Austin wierd. It's still got plenty of Texas flavor, with loads of great bars and restaurants, and friendly people everywhere you go. On a completely unrelated note, summer is pretty much here, and I thought I'd post an alubm of photos from a nice weekend I spent in Bournemouth, England last year chilling at the beach and hanging around town. Here's the slideshow. In a couple weeks I'm going to be back out in LA, and couldn't help but laugh at the various weather forecasts of some of the places I've been frequenting around the country lately. And as of today, it doesn't seem to be letting up any time soon. Working on putting some more photos online this week, I finally got around to some from one of my LA trips back in February, where a friend of mine and I went on an early morning hike in the hills behind our hotel. Speaking of weather, it wasn't a bad place to be as opposed to the below freezing temps back home in Boston that time of year. Working in Pittsburgh again this week, I've finally gotten around to getting all of my Bay to Breakers 2006 photos online. What an amazing day indeed. Although some think it's a great excuse to go in the buck, we had ideas of our own. From having a 14-foot wooden keg-filled, sound system-equiped Trojan horse to pull through the streets of San Francisco, it was a guranteed good time. Here are the photos. This past February / March I was lucky enough to be able to do a full lap around the globe, making stops in Boston, Tokyo, Singapore, Bangkok, Kuala Lumpur, and London. On the way I stopped in Malaysia to visit a cousin, and climbed Mt. Kinabalu, the highest mountain in Southeast Asia. I had no idea what I was in for, and what a climb it was. At 13,450 feet above sea level, it wasn't an easy task. Here's a link to the photo album with plenty of narrative along with the photos. I'm back working in Austin this week, right across from Lake Austin, and just finished adding an album I've been putting off for a long time. This one is from a weekend I spent in Paris last November near Montparnasse, and the collection is from Cimeti�re du Montparnasse. Last year at this time I was just starting a new project in the suburbrs of Paris along La Seine in Le Pecq, and I stayed at this quiet hotel which had a nice garden out back. Aside from the $15 an hour wireless internet, it was a pretty decent place. Here's a collection of photos from that week. "Only human beings have come to a point where they no longer know why they exist. They don't use their brains and they have forgotten the secret knowledge the spirit has put into every one of them; the are not even aware of this, and so they stumble along blindly on the road to nowhere - a paved highway which they themselves bulldoze and make smooth so that they can get faster to the big empty hole which they'll find at the end, waiting to swallow them up. It's a quick comfortable superhighway, but I know where it leads to. I've seen it. I've been there in my vision and it makes me shudder to think about it." I don't think I've ever read a book with so many spine-chilling stories and facts. Check out some of the reviews on Amazon and read this book. First off, Happy Cinco de Mayo. I'm still in Austin having survived one of the most intense rainstorms I've ever been in, and still don't have power at home. Since this blog of mine is brand new, I figured I'd start posting old photo albums that people have seemed to enjoy. Today's album is of Paris, France, where I spent most of last year working, hanging out in cafes, museums, and walking around the city taking photos. Not a bad deal. This one is a black and white album, and color should be coming soon. This week I'm in Austin, Texas. Over the past few weeks I've spent here, I'll occasionally bring my camera when I go running. Here's a link to the Ofoto album. I know, it's not called Ofoto anymore, but it's a lot easier than saying "Kodak Gallery". It's understandable. Supposedly people from Rhode Island have a habit of doing such things. I spent last week working at a client in the suburbs of Pittsburgh, PA. It was a lot nicer than I'd expected, but I can't say I'm planning on moving there any time soon. As one local said it when we met him for dinner at The Church Brew Works (one of the coolest restaurants I've ever been to), "No one actually moves to Pittsburgh. It's just a matter of time as to when you move out."